Issue & task tracking with JIRA. A good way for boosting your web development workflow is to look for possible integrations you can use with JIRA. The JIRA marketplace is a good place to start. JIRA is nowadays used in many different use cases: managing project requirements and tasks, tracking issues and even providing customer support. With the broad variety of uses cases, I definitely recommend decreasing duplication of work by integrating JIRA with other tools (you already use or should use). Filing a bug report isn’t that easy and may take some time, especially if you are not that tech-savvy. 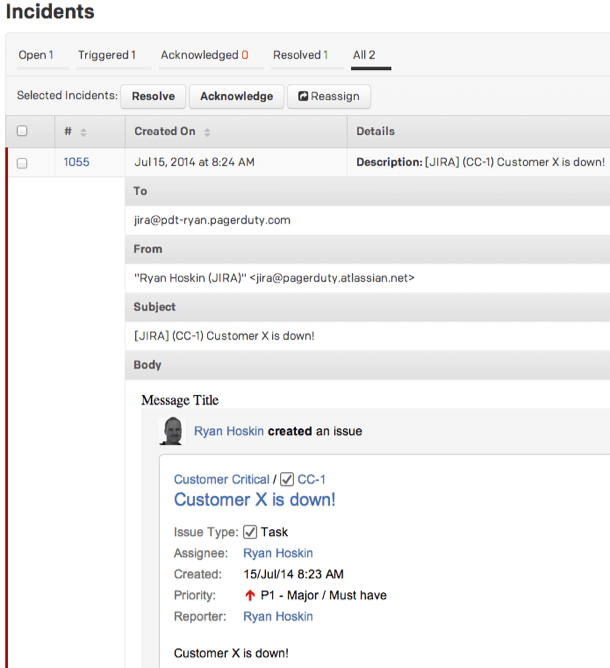 With the Usersnap add-on for JIRA, bug reporting becomes way easier. 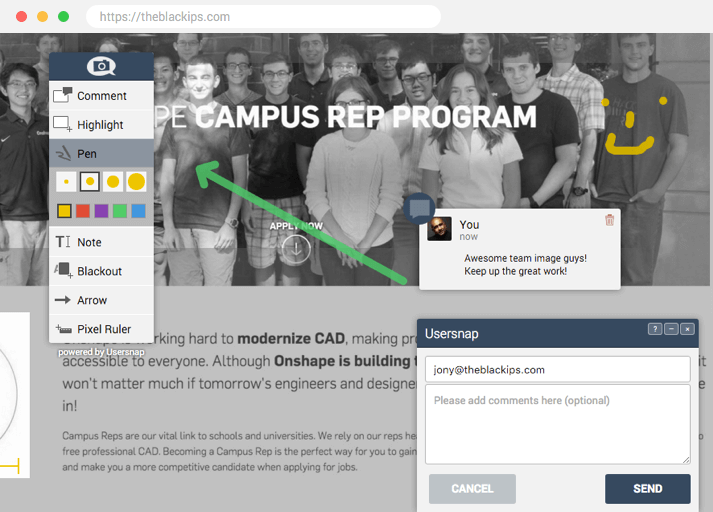 Simply embed the Usersnap widget on your website or prototype. Your clients and colleagues can report bugs which are automatically sent to your JIRA projects. The great benefit of adding Usersnap with JIRA? Clients can create screenshots and send those annotated screenshots to the developers in charge. By adding meta information about the user’s session (such as OS, browser version, etc.) to every JIRA ticket, fixing bugs gets much easier. Try the Usersnap add-on for JIRA for free. PS: If you consider Usersnap as a JIRA capture alternative, you should check out this comparison. Go agile with JIRA Agile. With the plugin JIRA Agile, you can enhance your JIRA products and make your software engineering team agile. 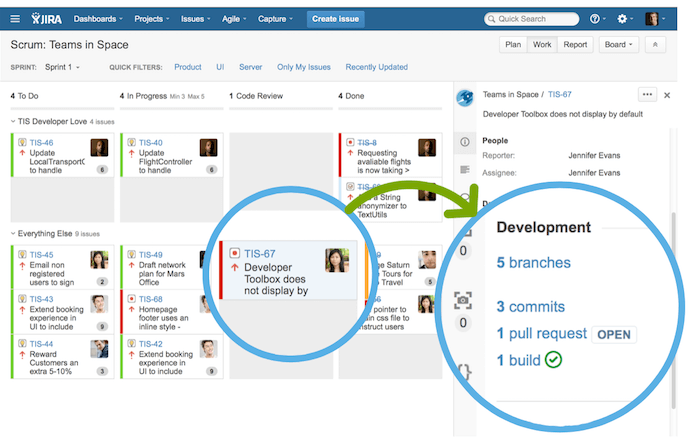 The JIRA Agile plugin basically allows you to set up sprints, backlogs and team activities. The plugin makes planning, prioritizing and executing new features painless and easy to manage. Learn how to set up JIRA Agile. Jenkins-CI is a continuous integration service which can be connected with JIRA. By making use of the Jenkins Plugin for JIRA, you can display Jenkins builds inside JIRA. While chatting with some great CTOs for our platform bugtrackers.io, the Jenkins CI integration for JIRA has been mentioned as a must-have for JIRA. PS: If you’re a heavy Jenkins user, you might like the JIRA plugin for Jenkins as well, which let’s you create links to relevant JIRA pages within Jenkins changelogs. Check out the Jenkins plugin for JIRA. I guess, you all know Slack, right? Slack is a great team messenger with a ton of integrations. I wrote about the best Slack integration for web developers in this blog post (definitely worth a read). With the Slack integration for JIRA, you get notified about important JIRA updates in your Slack chat. For example, you can be notified of new issues created with JIRA or changed issue statuses. Using HipChat instead of Slack? No worries. Since HipChat is part of the Atlassian family, you get covered as well and you can receive notifications in your HipChat rooms. Learn more about integrating JIRA with Slack or HipChat. Working in web development means working on the same code basis. This requires efficient collaboration between multiple people. With the GitHub integration for JIRA, developers and QA engineers can see the created branches, commits and pull request of GitHub. 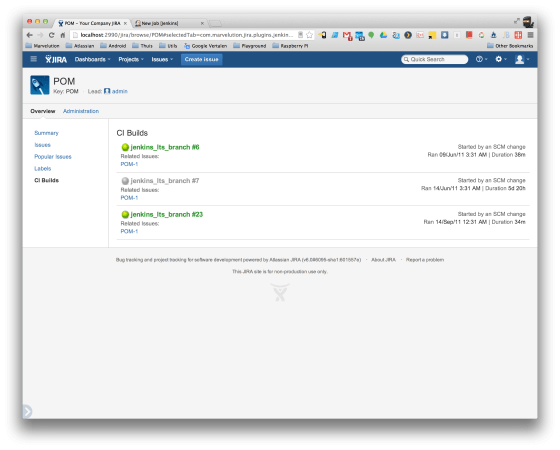 A detailed – but easy to follow – guide on setting up JIRA with GitHub can be found here. PagerDuty & JIRA: Notifications FTW. In one of our recent blog posts on the best SaaS monitoring tools, we’ve shown you the advantages of PagerDuty for alarm aggregation. PagerDuty basically allows you to integrate all your monitoring and alert systems. PagerDuty coordinates and manages all those aggregated notifications and ensures that each alert is delivered to the right person through text messages (SMS), emails or push notifications. By connecting PagerDuty with JIRA, you can make sure that a PagerDuty incident gets triggered when a new JIRA issue is created. Learn how to integrate PagerDuty with JIRA. Are you using JIRA for every single project-related task? Awesome. I’ll definitely recommend to check out Tempo Timesheets which allows you to track the time spent on each project. Get Tempo Timesheets for JIRA. That was a lot. Besides the mentioned great JIRA integrations there are definitely way more worth discovering. If you’re already familiar with JIRA I also recommend to play around with the mentioned integrations. Are you using JIRA or thinking about making the switch to JIRA? Let us know your favorite integration for JIRA in the comments. This article was brought to you by Usersnap – a visual bug tracking and user feedback tool for every web project. And a great alternative to JIRA.